This is your chance to work with an elite team in non-emergency transportation. Send your application to Vitalis Medical Transport Service. Competition exists but there is always one company that stands above the rest when it comes to non-emergency medical transportation. Do you want to set a schedule for a health needs assessment? Vitalis Medical Transport Service is at your service. Go ahead and send your request. 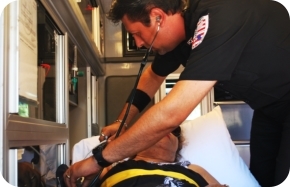 We, at Vitalis Medical Transport Service , are here to serve you with outstanding non-emergency medical transportation. Our team includes highly skilled professionals, who are trained to handle ground transportation for clients of various ages, sizes and health conditions. We make sure to give our clients a comfortable space during transport, regardless of their size or weight. We pride ourselves in being the only company in the area that specializes in bariatric transportation. If you or someone you know can benefit from our services, do not hesitate to click above and send your referral information. Let us be your preferred ground transportation company. When quality and professional service is a must, you can count on Vitalis Medical Transport Service. Feel free to call us at 956-661-1114.